MOGADISHU, Oct 19 2012 (IPS) - A Kenyan military advance into Somali territory to push back Islamic militants has had some measured military success – but is not without controversy. The capture of the Islamist-controlled southern Somali port city of Kismayo by Kenyan troops and allied forces in late September had been in the making for almost a year since the launch of operation Linda Nchi (Protect the Country) by Kenya. Hundreds of Kenyan army regulars supported by a local clan militia known as the Ras Kamboni Brigade from southern Somalia and northeastern Kenya joined forces to overrun the front defences of the Al Shabaab militants, following months of slow progress after the Kenyan forces crossed the border between the two countries in October 2011. Kenya’s Linda Nchi intervention in Somalia has been riddled with controversy since it was launched on Oct. 16, 2011. The stated aim of Kenya’s entry into this war-ravaged Horn of Africa country was the pursuit of Al-Shabaab militants accused of creating insecurity across the border in Kenya. The radical Islamist group is alleged to be behind the kidnapping of foreign aid workers and tourists and a number of bomb attacks in border areas. Kenya has reportedly been pushing for the region in southern Somalia known as Azania or Jubaland – where Kismayo is the main city – to be given the status of an autonomous state, to serve as a buffer zone between Kenya and the chaos in Somalia. The plan is to install an administration in cooperation with a local clan that inhabits both the northeastern Kenyan border regions and Somalia’s southern provinces, with the exclusion or minor participation of other clans who form the majority of the provinces’ residents. Hassan Mudei, deputy head of the Al Shahid Centre for Research and Media Studies in Mogadishu, says he believes the Kenyan project could fail if local sensitivities are not taken into consideration. “It will all depend on how local sensitivities and clan differences among the region’s inhabitants are acknowledged and respected. But if the Kenyan troops are seen as occupying forces, I believe they will never win the confidence of the local people, and the project would be doomed,” Mudei told IPS in Mogadishu. He said that Kenya and the other powers-that-be in the area should give local residents a free hand to work out a formula for sharing power, instead of letting one clan allied with them to try to dominate Jubaland – a move the Somali analyst contended would backfire. The Somali government, which has small numbers of troops trained by Kenyan forces in the southern regions along the border, has repeatedly voiced its opposition to the Jubaland project, saying it has a sovereign right to decide on the governance of the resource-rich provinces of the south. Kenya is currently sponsoring talks in Nairobi with leaders of a pro-Kenyan militia and Jubaland. Kenya says the negotiations are aimed at forming an administration for the region, but the Somali government has been sidelined because of its disapproval of the Kenyan initiative. “We have repeatedly expressed our displeasure at the Kenyan-led political process for the southern regions of Somalia that is now going on in Nairobi,” Ahmed Jama, a member of Somalia’s parliament, told IPS in Mogadishu. “Definitely we welcome Kenya’s role in helping the Somali National Army (SNA) liberate the country from militant forces, but for the political issues regarding Kismayo, that is only for the Somali government to deal with – and that is not what we are seeing now,” he said. Chirchir told IPS that the KDF’s aim under the African Union Mission in Somalia (AMISOM) is simply to enhance stability in the region, and that it does not have a political or occupation agenda. Chirchir added that after the KDF’s mandate is concluded, it will be up to Somalis themselves, with the help of regional bodies, including the African Union and the Inter Governmental Authority on Development (IGAD), to chart the way forward on how to govern themselves. 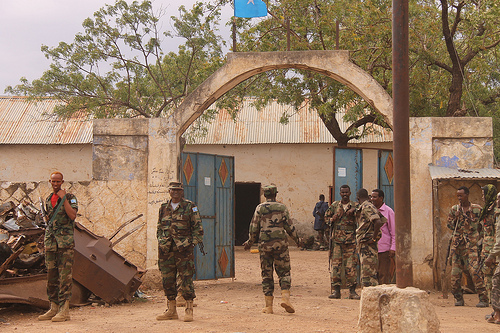 The coastal city of Kismayo has been under the control of various groups since the fall of the late Somali ruler Mohamed Siyad Barre in 1991, as alliances between different clans have changed. Kismayo, which has been under al Shabaab control for the past five years, has the biggest port and airport of all the southern Somalia provinces. It also has the most livestock and the largest amount of arable land in this country. “This is in essence a struggle for the resources of the region, and after a single clan failed to establish its authority over others, some have gotten the idea of using foreign countries in alliances to impose themselves over others,” Yasin Elmi, a Somali political scientist, told IPS. “That is what is happening now with the Kenyan intervention, whether Kenya knows this or not. But that arrangement between a foreign country and a local clan is likely to worsen the situation and prolong the local people’s suffering,” he added. Mudei agreed, saying any administration formed to run the province – and the city of Kismayo in particular – that does not come out of a local initiative is likely to be rejected by the residents. Mudei told IPS that the African Union peacekeeping forces, which Kenya belatedly joined in July, should be confined to establishing security in the region as stipulated in their mandate, and should leave political issues to the new Somali government, which knows the intricacies of local clan politics much better than foreigners. *Additional reporting by Brian Ngugi in Nairobi.